Two civil libertarians take up the cudgels against political correctness in speech codes at American colleges and universities. Kors is a professor of history at the University of Pennsylvania who represented a student—charged with shouting the epithet —water buffalo— at members of a black sorority having a rowdy party in a dormitory courtyard—in his intramural battle with the university. And Silverglate is a civil liberties litigator and legal columnist from Massachusetts. They take the egregious “Water Buffalo Affair” of 1993 as the jumping-off point for a wide-ranging, detailed, and legally informed study of how universities and colleges supposedly ride roughshod over First Amendment rights in the interest of curbing hate speech. 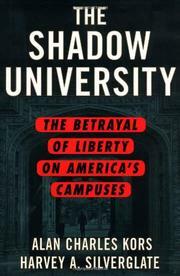 Their study, while often stimulating and revealing, undermines its own credibility with hysterical rhetoric: “Universities have become the enemy of a free society, and it is time for the citizens of that society to recognize this scandal of enormous proportions and hold these institutions to account.” How did we come to this desperate pass? “Whole departments of the liberal arts have been given to those for whom the universities represent, in their own minds, the revolutionary agency of culture.” Kors and Silverglate round up the usual suspects, but the late Herbert Marcuse—icon of the 1960s New Left—comes in for a special drubbing. With grudging admiration, they propose that his views on the limiting of free speech paved the way for Richard Delgado, Charles R. Lawrence III, Mari Matsuda, Catharine MacKinnon, and Stanley Fish, all of whom wish to curtail free speech in the interest of race and gender equality. The authors put academic freedom in historical perspective and offer illuminating observations about double standards and about the universities’ relationship to the courts, but the exaggeratedly polemical posturing undermines the reader’s confidence in their objectivity. While in many ways a fine and learned study, Kors and Silverglate’s hellfire-and-brimstone sermon will likely be heeded only by the saved.